136 pages, 8.5" x 11"
The fighters of the great bare-knuckle boxing era were tough men and skilled combatants. They had to be to endure brutal brawls that could last for hours, testing the skills and guts of both participants. In this fascinating tutorial on this poorly understood combative art, martial artists David Lindholm and Ulf Karlsson extract the practical material from historical bare-knuckle boxing and show how it can be applied in modern self-defense. 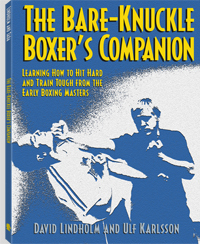 Lindholm and Karlsson have analyzed the surviving texts and illustrations of the masters of bare-knuckle boxing and organized what they've discovered into a complete program for training, conditioning and applying these skills in a real confrontation. In doing so, they show how bare knuckle is an ideal system for real-world self-defense. It contains strikes, throws, parries and a few basic kicks, so it is simple to learn. The techniques are remarkably powerful, which means you get a good payoff for each shot you land. It works regardless of the clothes you wear, the surface you stand on, the space you will fight in or how many attackers you meet. Bare knuckle is also easy to practice alone or with partners, because you need minimal space and equipment to train and enjoy its benefits. The bare-knuckle boxing era ended in the early 20th century, when gloves were introduced, stricter rules implemented and oversight organizations formed. This book is devoted to reviving this practical combative art. David Lindholm has trained in boxing, karate, sport fencing, iaido, kendo, wrestling and tai chi chuan, but since 1996 his main fields have been historical European martial arts and Japanese koryu sword arts. He is the coauthor (with Peter Svärd) of Sigmund Ringeck's Knightly Art of the Longsword and Sigmund Ringeck's Knightly Arts of Combat. Ulf Karlsson started training in the Japanese martial art Taido in 1984 and has instructed in that art since 1987, currently holding the grade of Godan Renshi. He has also trained in ESDS (Explosive Self Defence System), Ryu Te and most recently the Okinawan martial art Te.